The company claims the heritage of the Rogers Vacuum Tube Company, founded in 1925 by Edward Rogers, which started the CFRB radio station in Toronto, which was later acquired by outside interests. The present enterprise dates to 1960, when Rogers' son, Ted Rogers, founded Rogers Radio Broadcasting Ltd. That company acquired CHFI that year, as well as Aldred-Rogers Broadcasting, a partnership with Joel Aldred which helped launch CFTO in 1961. Rogers later bought out Aldred and started the current cable and wireless operations, known as Rogers Cablesystems Ltd. The chief competitor to the company is Bell Canada, which has a similarly extensive portfolio of radio and television media assets, as well as wireless, television distribution, and telephone services, particularly in Eastern and Central Canada; the two companies are often seen as having a duopoly on communications services in their regions as both companies own a stake of Maple Leaf Sports and Entertainment. However, the company also competes nationally with Telus for wireless services, and primarily indirectly with Shaw Communications for television service. However, Rogers and Shaw have since launched an online movie and television streaming service called 'Shomi'. In 1931, Rogers Sr. was awarded an experimental television licence in Canada. He was working on radar when, on May 6, 1939 he died suddenly due to complications of a hemorrhage. He was 38 years old. He left a widow, Velma, and a five-year-old son, Edward (Ted Rogers). While his business interests were sold, his son later determined to carry on his father's business. While Ted Rogers was an articling student with Tory, Tory, DesLauriers & Binnington, he started Rogers Radio Broadcasting Limited, which acquired Canada's pioneer FM station, CHFI-FM. In 1962, he pioneered stereo broadcasting in FM with CHFI and also founded CFTR in Toronto. By making available FM radios to boost FM penetration, which was only at 3% at the time, Ted Rogers was able to make more Canadians aware of FM transmitters. CHFI-FM quickly became one of Canada's most listened to FM radio stations and one of the most popular and profitable FM radio station in Canada. Rogers's interests in radio led him to cable television in the mid-1960s. He wanted Canada's fledgling cable operators to carry CHFI on a spare cable channel and the more he studied the cable world, the more he became attracted to the potential for programming choices on cable television. He entered the cable business in 1967, and was awarded television licences for areas in and around Toronto, Brampton and Leamington. In 1974, Rogers Cable Communications expanded past 12 channels, including several multicultural channels. Through a reverse-takeover in 1979, Ted Rogers's company, Rogers Cable TV Limited, acquired control of Canadian Cablesystems Limited. In 1980, the company purchased Premier Communications Limited, which almost doubled the number of cable subscribers and made Rogers Communications the largest cable television company in Canada. As a founding shareholder of Rogers Cantel Inc., which commenced service in 1985, the company entered the mobile phone market. The company operated a national cellular telephone network in Canada in competition with the established telephone companies. Rogers Cantel Mobile Communications Inc., which is now called Rogers Wireless, is now a public company 51% of which is owned by Rogers Communications. Between 1979 and 1982, Rogers Communications acquired and built a number of cable television systems in the United States. In March 1989, the company completed the sale of its US cable television interests for CDN $1.581 billion. In 1986, Rogers Cablesystems changes its name to present-day Rogers Communications Inc. This led to Rogers Communications Inc. acquiring 40% of Unitel Communications, formerly CNCP Telecommunications, in September 1989. Unitel was granted permission by the Canadian Radio-television and Telecommunications Commission in June 1992 to compete with the Canadian telephone monopolies in the long-distance market. In January 1993, 20% of Unitel Communications was sold to AT&T Corporation. As a result of this transaction, Rogers Communications Inc.'s interest in Unitel was reduced to 32%. In September 1995, Unitel Communications reached an agreement in principle with AT&T and certain of its bankers to restructure Unitel. At the close of this transaction, Rogers Communication no longer had an equity investment in Unitel. On March 31, 1994, Rogers Communications Inc. completed an offer for the shares of Maclean-Hunter and on December 19, 1994, the Canadian Radio-television and Telecommunications Commission (CRTC) approved the transaction. 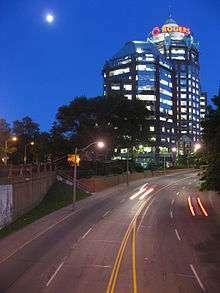 The publishing assets of Maclean-Hunter were subsequently combined with its existing radio and television operations to form Rogers Media Inc.
On January 1995, Rogers along with several other cable companies, added a number of new cable channels under a negative option billing plan. Subscribers opting out of paying for the new channels stood to lose much of their existing speciality channel programming. The participating cable companies were hit by both regulatory and public opinion backlash and ultimately were forced to split the negative-option channels into two separately-purchasable blocks, a move which Rogers had initially opposed as "not technologically feasible". Rogers logo used from 2000-2015. Prior to the late 2000s, a non-flat version of the mobius strip was used. Rogers Communications Inc. unveiled its new Mobius strip logo on January 17, 2000 marking the departure of its original logo. In 2000, Rogers acquired Cable Atlantic from Newfoundland businessman Danny Williams. The deal, worth $151.8 million, brought Rogers approximately 75,000 subscribers. With the purchase of Cable Atlantic Rogers scrapped its plan to buy Vidéotron which was later purchased by Quebecor. That same year, they acquired the Toronto Blue Jays Baseball Club. In 2004, they acquired Skydome, which is the Blue Jays home venue and largest covered indoor entertainment complex in Canada. The complex was renamed Rogers Centre in February 2005. Also in 2000, Rogers bought the Arena Football League team, the New England Sea Wolves and after the 2000 season, Rogers moved them to Toronto and renamed the team the Toronto Phantoms. Due to lack of interest and poor ticket sales, the team ceased operations in 2002. In July 2001, Rogers Media acquired CTV Sportsnet, and renamed Rogers Sportsnet that November. The FAN 590 sports radio station joined Rogers Media in August 2001 along with 14 Northern Ontario radio stations. Rogers On Demand was launched as a home video library over cable in February 2002, and in November 2003, Rogers Cable made personal video recorders (PVRs) available to its subscribers. In summer 2004, Rogers partnered with Yahoo! to create Rogers Yahoo!, which offers Yahoo! premium features to Rogers broadband internet customers. In fall 2004, several strategic transactions were executed that significantly increased Rogers exposure to the potential of the Canadian wireless market. Rogers acquired the 34% of Rogers Wireless owned by AT&T Wireless Services Inc for $1.77 billion. Soon thereafter, Rogers Wireless acquired Microcell Telecommunications Inc., along with its popular Fido brand, which created Canada's largest wireless operator and only GSM provider. In December, Rogers Communications repurchased the shares of Rogers Wireless that were publicly held and proceeded to take the company private which significantly enhanced the company's operating and financial flexibility. Coinciding with the twentieth anniversary of Rogers' launch of wireless services, on July 1, 2005, Rogers Home Phone voice-over-cable local telephony service was introduced in the Greater Toronto Area and also successfully completed the acquisition of Call-Net Enterprises Inc. (now Rogers Telecom Holdings Inc.), a national provider of voice and data communications services. In 2007, Rogers entered a tentative deal to purchase the A-Channel stations, CKX-TV, Access, Canadian Learning Television and SexTV: The Channel from CHUM Limited, as part of the latter company's pending takeover by CTVglobemedia. This transaction was contingent on CRTC approval of CTVglobemedia's takeover of CHUM. However, on June 8, 2007, the CRTC approved the CTV transaction conditional on CTV divesting itself of Citytv rather than A-Channel, effectively voiding the deal. On June 12, it was announced that Rogers had made a new offer of $375 million for the Citytv stations. The transaction was approved on September 28, 2007, the same date when "Rogers Park" in Brampton, Ontario was officially opened. On June 28, 2007, Rogers further offered to sell the two religious-licensed OMNI stations in Winnipeg and Vancouver as part of the Citytv deal, although the company stated that it intended to retain the multilingual-licensed OMNI stations. On July 7, Rogers also announced a takeover offer for Vancouver's multicultural station CHNM. The transaction was approved on March 31, 2008. In September 2007, Rogers has also applied to the CRTC to acquire 20 per cent of CablePulse 24, a local news channel in Toronto which was previously paired with Citytv (both stations were previously owned by CHUM Limited) but was retained by CTVglobemedia in the June 8 licence approval. However, in early December, CTV withdrew the application and announced that Rogers Media and CTVgm had come to a deal in which Rogers waived their 20% stake. On February 13, 2008, Rogers announced a takeover offer for Aurora Cable, a cable service provider in York Region, Ontario. The sale was finalized on June 12, 2008. On December 2, 2008, Edward S. Rogers died of heart failure. On September 9, 2009, Rogers Cable filed a lawsuit in an attempt to prevent Shaw Cable from acquiring Mountain Cablevision of Hamilton, Ontario, on the basis that Rogers and Shaw had effectively agreed to divide the country in half, Rogers in the east and Shaw in the west. This suit was defeated on competitive grounds and the Shaw acquisition allowed to proceed. In 2012, Rogers Cable filed a complaint in an Ontario court against penalties levied under a 'Truth in Advertising' law, claiming that the amount of the penalties, and the requirements imposed by the law, are in violation of the Charter of Rights and Freedoms. The company has also had to recognize the rising market trend of customers canceling or foregoing cable television service subscriptions in favor of cheaper alternate content delivery means such as streaming media services like Netflix, a demographic called "cord cutters" and "cord nevers." In response, Rogers is now acquiring content with a speculated cost of $100 million to begin their own competing online streaming service, Shomi, much like the American Hulu Plus, in the near future. CEO Guy Laurence has spoken out about an upcoming change meant to jumpstart growth at the company. Laurence has not released any specific details, but says that the strategy will help allow the company's telecom and media units to work better together. In the summer of 2014, Rogers reported a 24% drop in profit compared to the previous year's second quarter. Rogers Communications is traded on the Toronto Stock Exchange and on the New York Stock Exchange under ticker "RCI". Following the death of Ted Rogers in 2008, control of Rogers Communications passed to the Rogers Control Trust, a trust for which a subsidiary of Scotiabank serves as trustee. Ted's son Edward Rogers III and daughter Melinda Rogers serve, respectively, as Chair and Vice-Chair of the trust. Thomas I. Hull – Chairman and Chief Executive Officer, The Hull Group Inc.
Philip B. Lind, C.M. – Vice Chairman, Rogers Communications Inc.
Isabelle Marcoux – Chair of the Board, Transcontinental Inc.
Edward S. Rogers – Deputy Chairman, Rogers Communications Inc.
A Rogers Plus store in Markville Mall in Markham, Ontario. Rogers Cable is the largest cable television provider in Canada offering cable television, high-speed Internet access, residential telephony services, and video retailing. A sub division is Rogers Business Solutions division is a national provider of voice communications services, data networking, and broadband Internet connectivity to small, medium and large businesses. Rogers Wireless is Canada's largest voice and data communications services provider. Rogers Media is Canada's premier collection of category-leading media assets with businesses in radio and television broadcasting, televised shopping, publishing and sports entertainment. Rogers Cable is Canada's largest cable television service provider with approximately 2.3 million customers in southern Ontario (90% of customers), New Brunswick and Newfoundland and Labrador. Its growing digital cable service provides access to technologies such as high definition television, video on demand, interactive television and enhanced television. Rogers also provides broadband Internet access (Rogers Hi-Speed Internet), co-marketed with Yahoo!. Rogers has been subject to considerable scrutiny and backlash over its duopolistic business practices and Internet Protocol packet shaping for peer-to-peer content. Rogers Retail is the corporate retailer for Rogers Communications Inc. and operates retail locations under the Rogers Plus and Fido brand names. Customers of Rogers Cable also get access to Rogers TV and TV Rogers, a volunteer based local television channel. This unit was created in 1967. As well, through Rogers Cable Inc., Rogers owns a majority interest (41.4%) in CPAC. Rogers Telecom (formerly Call-Net Enterprises which did business under the Sprint Canada brand) is a major competitive telephone carrier throughout Canada. Since acquiring Call-Net, Rogers has also entered into the lucrative residential phone business under the Rogers Home Phone brand, to challenge Bell Canada, using both traditional and VoIP technologies. As of 2007, Rogers Telecom has been rolled into the Rogers Cable business unit. Rogers Communications is Canada's largest wireless communications services provider, under the Rogers Communications, Fido, Chatr Wireless and Cityfone brand names, with 10.1 million voice and data subscribers as of Q3 2016. The unit was previously known as Cantel, Cantel AT&T, and Rogers AT&T Wireless (U.S. firm AT&T Wireless was a shareholder for a time). In 2011, Rogers launched a home monitoring service which utilizes both its wireless network and cable network. The service includes a touchpad home monitoring console to manage multiple utilities at home, including security sensors and cameras, thermostat, appliances and lighting. Management and access to these services is also available on smartphones through a home monitoring application. Rogers Media owns Canada's largest publishing company, Rogers Publishing Limited, which has more than 70 consumer and business publications, 52 radio stations, television broadcasting with Omni Television, City, Sportsnet, Sportsnet One, Sportsnet World, Sportsnet 360, OLN, Nextissue, G4 Canada, The Biography Channel Canada, FX, FXX and The Shopping Channel which is Canada's home shopping service. Rogers Publishing Limited publishes more than 70 consumer magazines and trade and professional publications, digital properties and directories in Canada, including Maclean's, Canada's weekly newsmagazine; its French-language equivalent, L'actualité; Sportsnet Magazine; Chatelaine; Flare; and a variety of other magazines and their companion web sites. The publishing arm was once part of the Maclean-Hunter Publishing empire. Unlike Maclean-Hunter, Rogers does not have printing facilities and has contracted out services (in 2008 contracted to Montreal-based TC Transcontinental to print magazines from their plants across Canada). A Rogers Cable office in Moncton. Rogers Broadcasting operates 52 Canadian radio stations (Rogers Radio), (44 FM and 8 AM radio stations) including three FM stations launched in the Maritimes in October 2005; Omni Television, which operates two multicultural television stations in Ontario (OMNI.1 and OMNI.2) as well as one in Vancouver Omni BC (formerly Channel M) acquired in April 2008; Citytv acquired in 2007; which operates 5 stations in Toronto, Winnipeg, Calgary, Edmonton and Vancouver; Sportsnet, a specialty sports television service licensed to provide regional sports programming across Canada; The Shopping Channel, Canada's only nationally televised shopping service and The Biography Channel Canada, acquired outright in August 2006 when Rogers bought out the 40% stake owned by Calgary's Shaw Communications and A&E Television Networks' 20% ownership. Rogers also is a partner in OLN, Viewers Choice and is a two-thirds owner of G4 Canada with Comcast. Some of the better known radio outlets are CHFI Toronto, CJCL Toronto (The FAN 590), CFTR Toronto (680 News), and various stations operating under the Jack FM brand. In summer 2006, Rogers acquired five stations from OK Radio in Alberta and, with regulatory approval, will be operating in Edmonton, Fort McMurray and Grande Prairie. Existing clusters of stations are in Vancouver-Victoria-Whistler, Calgary-Lethbridge, Winnipeg, Toronto, Ottawa, Kitchener and Halifax-Moncton-Saint John, NB. In 2007, Rogers entered a tentative deal to purchase the A-Channel stations, CKX-TV, Access, Canadian Learning Television and SexTV: The Channel from CHUM Limited, as part of the latter company's takeover by CTVglobemedia. This transaction was contingent on Canadian Radio-television and Telecommunications Commission (CRTC) approval of CTVglobemedia's takeover of CHUM. However, on June 8, 2007, the CRTC approved the CTV transaction conditional on CTV divesting itself of Citytv rather than A-Channel, effectively voiding the deal. On June 12, it was announced that Rogers had made a new offer of $375 million for the Citytv stations. The transaction was approved on September 28, 2007, the same date when "Rogers Park" in Brampton, Ontario was officially opened. On June 28, 2007, Rogers further offered to sell the two religious-licensed OMNI stations in Winnipeg and Vancouver as part of the Citytv deal, although the company stated that it intended to retain the multilingual-licensed OMNI stations. On July 7, Rogers also announced a takeover offer for Vancouver's multicultural station CHNM. In September 2007, Rogers has also applied to the CRTC to acquire 20 per cent of CablePulse 24, a local news channel in Toronto which was previously paired with Citytv (both stations were previously owned by CHUM Limited) but was retained by CTVglobemedia in the June 8 licence approval. Neither CTVglobemedia nor Rogers has, to date, announced whether this application will change future plans for the station. In 2012, Rogers purchased CJNT-DT Montreal and on February 3, 2013, it was rebranded as City Montreal. In addition to its ownership of Sportsnet, acquired from CTV, Sportsnet One and Sportsnet World, Rogers Media operates the Toronto Blue Jays baseball team through Rogers Blue Jays Baseball Partnership and the Rogers Centre (previously known as SkyDome). Through Sportsnet, Rogers Media also holds a 50% ownership in Dome Productions, a mobile production and distribution joint venture that is a leader in high-definition television production and broadcasting in Canada. Rogers also owns the naming rights to Rogers Arena, home of the Vancouver Canucks., as well as Rogers Place, the home of the Edmonton Oilers. On December 9, 2011, the Ontario Teachers' Pension Plan announced the sale of its majority stake in Maple Leaf Sports & Entertainment to Bell Canada and Rogers Communications, in a deal expected to be valued at around $1.32 billion. Additionally, Larry Tanenbaum will increase his stake in the company to 25%. On August 25, 2012, Rogers Media agreed to acquire Score Media which includes The Score Television Network for $167 million, including a 10% stake of its digital business. The deal was completed on Oct. 19, 2012. On November 26, 2013, Rogers Communications Inc, unveiled the details of a 12-year, C$5.2 billion partnership with the National Hockey League which began in the 2014–15 season. This will give Rogers the controlling stake for national broadcast and digital rights of the NHL and will ultimately give them the ability to stream all NHL feeds on all of their current platforms replacing both Bell Media and CBC Sports as the national broadcast and cable television rightsholders respectively. The effects of this deal will shift the balance of power in the country's broadcast industry as it will drive demand for Rogers Cable TV subscriptions. This transaction marks the first time a first-class North American-wide sports league has allowed all its national right to one company on a long-term basis. As part of the deal, Rogers also took over Canadian distribution of the NHL Centre Ice and GameCentre Live services. National English-language coverage of the NHL is carried primarily by Rogers' Sportsnet group of specialty channels; Sportsnet holds an exclusive window for games played on Wednesday nights. Hockey Night in Canada was maintained and expanded under the deal, airing up to seven games nationally on Saturday nights throughout the regular season across CBC Television, the Sportsnet networks, Rogers-owned television network City, and FX Canada. While CBC maintains Rogers-produced NHL coverage during the regular season and playoffs through a time-brokerage agreement with the company, Rogers assumes editorial control and the ownership of any advertising revenue from the telecasts. City also airs a Sunday night game of the week, Rogers Hometown Hockey, which features a pre-game show originating from various Canadian communities. Sportsnet's networks also air occasional games involving all-U.S. matchups. Under a sub-licensing agreement with Rogers, Quebecor Media holds national French-language rights to the NHL, with all coverage airing on its specialty channel TVA Sports. TVA Sports' flagship broadcasts on Saturday nights focus primarily on the Montreal Canadiens. Rogers sought to increase the prominence of NHL content on digital platforms by re-launching the NHL's digital out-of-market sports package GameCentre Live as Rogers NHL GameCentre Live, adding the ability to stream all of Rogers' national NHL telecasts, along with in-market streaming of regional games for teams whose regional rights are held by Sportsnet. GamePlus—an additional mode featuring alternate camera angles intended for a second screen experience, such as angles focusing on certain players, net and referee cameras, and a Skycam in selected venues, was also added exclusively for GameCentre Live subscribers who are subscribed to Rogers' cable, internet, or wireless services. In the lead-up to the 2014-15 season, Rogers began to promote its networks as the new home of the NHL through a multi-platform advertising campaign; the campaign featured advertising and cross-promotions across Rogers' properties, such as The Shopping Channel, which began to feature presentations of NHL merchandise, and its parenting magazine Today's Parent, which began to feature hockey-themed stories in its issues. On May 28, 2014, Rogers announced a six-year sponsorship deal with Scotiabank, which saw the bank become the title sponsor for Wednesday Night Hockey and Hockey Day in Canada, and become a sponsor for other segments and initiatives throughout Rogers' NHL coverage. On October 6, 2014, Rogers and NHL began their media sales venture in which Rogers will lead all Canadian national NHL media sales across its owned and operated broadcast and digital platforms as well as ad sales for League-owned digital assets in Canada. In 2011, a partnership was formed between Rogers Communications and Yodle, Inc to provide a suite of digital marketing services to Canadian small, medium, and enterprise size business. These solutions have been deployed under the name OutRank by Rogers and operate as a business unit within the company. Services include search engine optimization, mobile marketing, social media marketing, pay per click, and analytics. The opening was announced in January 2012 with the launch of their first client, Ontario-based CLS Roofing. OutRank by Rogers is a Google Premier SMB Partner and promotes responsive web design. The company is a donor to the Ronald Mcdonald House of Toronto. In May, 2013 Rogers Communications launched "Vicinity", a loyalty and marketing automation platform for small and medium businesses in Canada. The platform provides local retail businesses across Canada with the opportunity to provide customized loyalty programs. Vicinity was launched in partnership with FiveStars Loyalty, a US-based rewards program from Silicon Valley. In August, 2011 Rogers Communications launched "Rogers Smart Home Monitoring" in Ontario, a security system that lets homeowners control appliances and thermostats remotely using a smartphone. In February 2015, the Smart Home Monitoring System was expanded it service to Vancouver. In 2008, Rogers Communications launched Zoocasa, an online real estate listing service. The company later became a licensed real estate brokerage and in May 2013, the website relaunched to allow homebuyers to find properties and agents. The service also provided rebates on real estate commissions to buyers and sellers. Zoocasa was shut down on June 22, 2015. The website's domain and technology were purchased for $350,000 and the website relaunched on July 2, 2015 under new ownership. In August, 2013 Rogers Communications launched Rogers Bank, a Schedule I bank, which offers Rogers Platinum MasterCard credit card. ↑ "Contact Us Mail or Fax." Rogers Communications. Retrieved on November 22, 2013. ↑ Rogers Communications. "History of Rogers". Retrieved 2012-05-31. ↑ "Rogers buys AT&T stake in cell unit". The SeaBoard Group. ↑ Rogers uses charter claim to fight truth in advertising. The Vancouver Sun. Archived January 28, 2012, at the Wayback Machine. ↑ "Rogers may launch Netflix rival for $100M". CBC News. 10 January 2014. Retrieved 11 January 2014. ↑ Dobby, Christine. "Rogers CEO hints at new media strategy as profit slips again". Financial Post. Retrieved 20 May 2014. ↑ Greenwood, John. "Rogers Communications Inc. profit drops 24% as revenue growth slows". Financial Post. Retrieved 5 August 2014. ↑ CRTC ownership chart for Rogers Communications Archived February 3, 2007, at the Wayback Machine. ↑ "Board of Directors". Retrieved 24 April 2015. ↑ "Senior Leadership". Retrieved 22 January 2015. ↑ "Rogers Arena: New name for home of the Vancouver Canucks". Rogers Communications. Retrieved 31 October 2013. ↑ "Rogers will only have small stake in Score Media's digital growth". The Globe and Mail. Toronto. August 25, 2012. ↑ "Rogers Media Completes Acquisition of Score Media". newswire.ca. Toronto. October 19, 2012. ↑ Christine Dobby (26 November 2013). "NHL, Rogers Communications Inc reach 12-year broadcast deal worth $5.2-billion". Financial Post. ↑ "NHL, Rogers Communications announce 12-year, $5.2 billion TV, multimedia deal". NHL.com. ↑ "Rogers will allow you to watch even more NHL games online this season … just not all of them". National Post. Retrieved September 18, 2014. ↑ "How do you like your hockey? Rogers, NHL want to find out". The Globe & Mail. February 4, 2014. Retrieved July 15, 2014. ↑ "Rogers GamePlus has NHL angles covered, but app will come at a price". The Globe and Mail. Retrieved October 8, 2014. ↑ "Rogers ramps up NHL ad buys". The Globe & Mail. July 6, 2014. Retrieved July 15, 2014. ↑ "Rogers and Scotiabank reach NHL sponsorship deal". Toronto Star. Retrieved May 29, 2014. ↑ "NHL and Rogers announce media sales partnership". NHL.com. ↑ "Multi-Location: ONE Solution". Outrank by Rogers. Retrieved 30 September 2014. ↑ Thomas, Ryan. "Why Most Renovations Start In The Kitchen And What Homeowners Might Be Missing". Wall Street Journal. Retrieved 30 September 2014. OutRank by Rogers helps small businesses connect with potential customers. ↑ "Yodle Shows Strong Momentum in a Record-Breaking 2012". Retrieved 17 October 2014. ↑ "Getting customers, a keyword at a time". Vancouver Sun. Retrieved 17 October 2014. ↑ "Why Most Renovations Start In The Kitchen And What Homeowners Might Be Missing". Wall Street Journal. Retrieved 17 October 2014. ↑ Arellano, Nestor. "Rogers targets small biz with new online marketing suite". ITBusiness. Retrieved 30 September 2014. Called Outrank, the service promises to help companies generate more inbound phone calls and emails by offering a suite of products that include Web site design, search engine optimization (SEO) services, campaign tracking and paid search marketing. ↑ Roseman, Ellen. "Refunds can be elusive without media help: Roseman". Toronto Star. Retrieved 30 September 2014. ↑ Atchison, Chris. "Creating a Mobile Website". Connected for Business. Retrieved 30 September 2014. ↑ Condron, Frank. "Don't Ignore Online Customers". Profit. Retrieved 30 September 2014. ↑ Laermer, Emily. "Online marketer Yodle expanding into Canada". Crain's New York Business. Crain Communications Inc.
↑ "Find a Premier SMB Partner to help grow your business". Google. Retrieved 17 October 2014. ↑ "OutRank by Rogers' Small Business Customers See 60% Rise in Web Traffic From Mobile Devices". Retrieved 17 October 2014. ↑ "Home for Dinner Photos - Outrank by Rogers". Ronald McDonald House Charities. Retrieved 30 September 2014. ↑ "Rogers shuts down discount brokerage Zoocasa | Toronto Star". thestar.com. Retrieved 2016-10-16. ↑ "Rogers Communications sells Zoocasa real estate site | Toronto Star". thestar.com. Retrieved 2016-10-16. ↑ "Rogers gets closer to starting banking business". Financial Post. 2013-05-03. Retrieved 2013-09-23. Wikimedia Commons has media related to Rogers Communications.